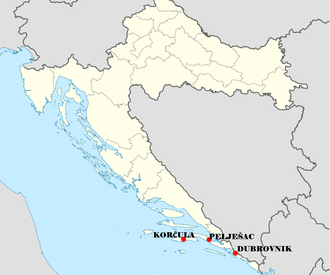 The tour starts with a coastal drive along the Peljesac Peninsula to the town of Orebic where you’ll take a boat over to the Island of Korcula, the birth place of Marco Polo! You’ll hear about this fascinating former Venetian walled town, the local history and loads of interesting tid bits. After free time you’ll cross back over to the mainland on the Peljesac peninsula for some of the best vistas on the Dalmatian Coast, stopping at a family run winery for wine tasting of local grape varieties. Your next stop is the medieval walled town of Ston. It’s walls were built in the 16th century and at that time were the second longest defense walls in the world after the Great Wall of China! You can walk part of the walls, see the ancient Roman salt flats and stroll through the cobbled streets of the town. Ston is the oyster and mussels capital of Croatia and the restaurants & taverns specialize in this cuisine and local wines. Afternoon arrival back in Dubrovnik. Meeting point: If you’re arriving by cruise liner your guide will be waiting for you in front or your ship or tender with your name on a sign. If your group has more than 10 people send us an inquiry for a special quote. Tour includes: Expert local licensed guide, air-conditioned transport, highway & parking tolls. Tour does not include: Entrance fees & meals.